Furnace Maintenance | Mullin Inc.
Mullin is proud to offer a wide range of HVAC services, performed by professionally-trained and certified technicians and designed to meet every customers home comfort needs exactly. Our Repair professionals know what it takes to beat the heat in Oklahoma. 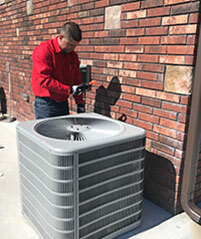 With years of experience and top-notch training you can be sure that Mullin knows how to provide the AC Service that you deserve. We hold a Better Business Bureau A+ Accredited Business Rating and have been in business since 1974. Let us show you why Mullin makes all the difference.